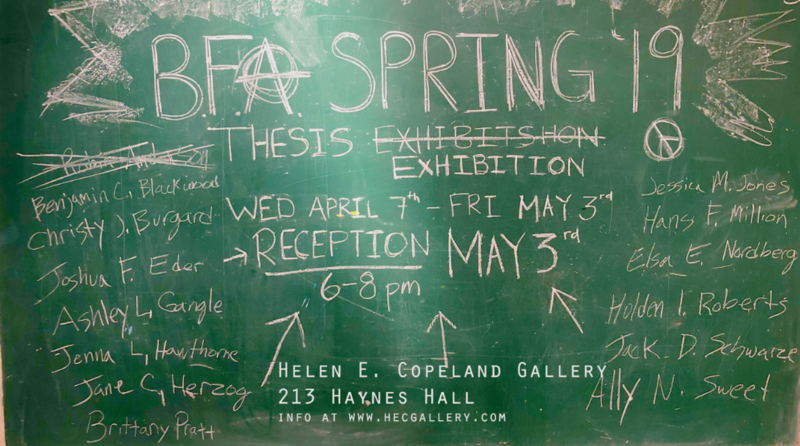 Please join The School of Art at Montana State University as we welcome our new MFA Graduate candidates for the Incoming Grad Show at the Helen E. Copeland Gallery, located on the second floor of the School of Art in Haynes Hall, Bozeman MT, on 11th Avenue, across from the Duck Pond. The show is currently on exhibit until Wednesday, September 7th, 2016. The Closing Reception is Wednesday, September 7th, 2016 from 6:00-8:00 p.m. and will be free and open to the public. There will be hors d’oeuvres and a cash bar. On view will be work the work of five new MFA candidates: Alyssa Willard, Victoria Burchill, Megan Sprenger, Matt Levy, and Jon Bashioum. Heralding from across the country, these five artists work in many mediums including ceramic, metal, mixed media, and paint. Over the next three years, these artists will perfect their skills and concepts before presenting their thesis work in 2019. For more information on this exhibition, or on the Helen E. Copeland Gallery in general, please visit http://hecg.worpress.com or follow us on Facebook (http://facebook.com/msuhecg). Stay tuned to our website and Facebook page for more information on School of the Arts lectures, visiting artists, and events. ALYSSA WILLARD, CLERODENDRUM, 2016. OIL ON CANVAS, 18 X 48 IN. JON BASHIOUM, JAR, 2015. STONEWARE. BOLO: 3.25 X 1 X 40 IN. MATT LEVY, TEAPOT, 2015. WOOD-FIRED STONEWARE/ KAOLIN FLASHING SLIP OVER IRONMAN SLIP, 6 X 6 IN. MEGAN SPRENGER, SACRED RELIQUARY, 2015. FIRED CERAMICS WITH UNDERGLAZE, STAINS, AND DECALS, 24 X 24 X 5.75 IN.